Craving for authentic Chinese dishes but can’t choose which? .. Hap Chan’s first Shabu-Shabu and buffet branch at Robinsons Galleria, and avail of their special opening promo! Pay for 3, and 1 gets to eat for FREE, so it’s a 3+1 Promo! 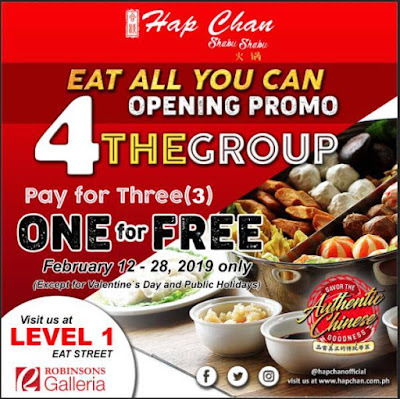 Hap Chan Galleria is located at Level 1 Eat Street, Robinsons Galleria Ortigas.